The problem with my daily writing habit is that I don’t have one. I mean to write every single day but then life happens— laundry, cooking, handling a sheep escape or a cat who wants to give birth in my lap— and writing is the thing that gets pushed out. So I’ve gone back to Monica Leonelle’s book, ‘The 8-minute Writing Habit’ and started to do my 8 minute writing sprints. Miss Leonelle’s book has helped me— it’s gotten me to take up writing by dictation, and to track my writing sprints on a spreadsheet. But this month I’ve checked my calendar and out of the 13 days in the month so far, I’ve only written on 3 of them (counting today.) What is wrong with me? I’ve been thinking that over and I’ve decided this is the problem: though the Leonelle method would allow me to do just 1 writing sprint of 8 minutes and call it a day, I haven’t been doing that. I have been requiring myself to do 3 writing sprints. That’s 24 minutes of just writing, plus with writing down the results of the writing sprints, entering them into the spreadsheet, bathroom break, getting up to walk around a little to prepare for the next sprint— I’m doing 30 to 45 minutes, and even though I hadn’t calculated it out, my brain knows I’m not just asking myself to write for 8 minutes, but use up a significant chunk of time. So I put it off till later, and the late evening comes and my brain is tired from the day and just wants to play the Walking Dead game on my smartphone, and my body wants to take a bath and go to bed, and there went writing for that day. So— change of plan. This morning instead of doing my writing just after getting dressed, I got up, put the cats off of me, and did urgent things like a bathroom visit and drinking a glass of water and feeding the cats, and then sat right down and did 8 minutes. I may do more writing sprints today on my WIP. Or I may not. I have a lot of things to do today, like the blogging I’m doing right this second, or checking in with my online discussion groups, or folding clothes or moving the chicken pen with the GOOD chickens to somewhere the predator can’t find them…. As Miss Leonelle points out in her book, many writers who are NOT writing daily will do more words in a month with ONLY 8 minutes a day than they are doing now with longer writing sessions that they only manage to do 4 or 5 days a month. EXERCISE: Stop right now. Close or minimize your browser, set a timer for 8 minutes, and WRITE! How many words did you do? How do you feel about it? Do you think you can do 8 minutes tomorrow? Please comment about it on this blog post. My current WIP: Don’t have a title yet. It’s space colony fiction set in the same universe as some stories I’ve written. Main character is a girl from Earth who is sent to a colony where she ends up as a teacher of the children of a nobleman. I gave her the temporary name Amanda because my dictation software can spell Amanda, but the name is growing on me. 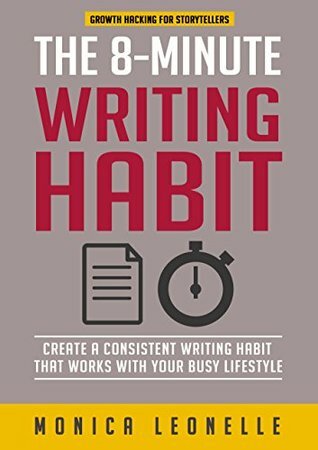 Why only 8 minutes to build a daily writing habit? Lately I have been working on developing a daily writing habit. Main reason: when I take a day or two off from writing, that leads to a writingless week or even more. Which tends to turn current writing projects into ones that aren’t going anywhere. What inspires me is the idea of doing a daily 8-minute timed writing stint (you are allowed to do more.) To get more accountability, I post daily on Facebook, tagging a few friends who also are working on their writing habit. But the question is, why 8 minutes? Wouldn’t it be better to do an hour or two? Or even three or four hours like most professional writers do? The problem is this: if you are trying to build a writing habit, but you know you have to do an hour or more at each writing session, it’s too easy to decide you just don’t have time for writing today. But 8 minutes— that’s not so much of a challenge. I once did my 8 minutes just before bedtime when I thought my brain was already asleep. My brain woke up and did its job surprisingly well. The thing about doing 8 minutes of timed writing it leads to longer writing. If you really get on a roll, are you really going to stop at 8 minutes and not even add a sentence or two? Sometimes I do a few 8 minute sessions and then perhaps do 20 or 25 minutes because I’m really hot. 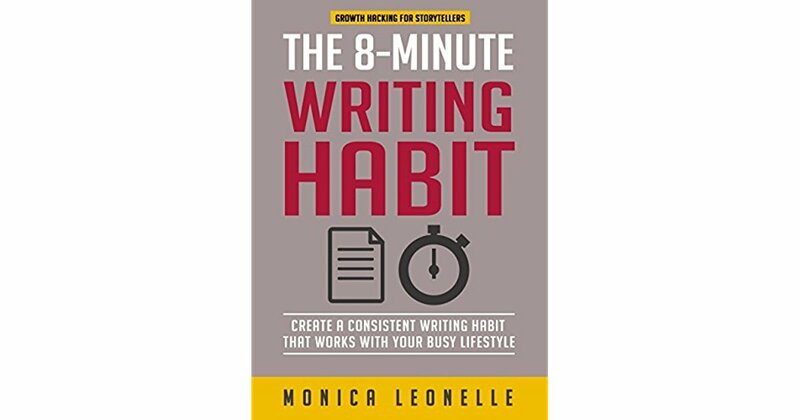 Monica Leonelle suggests in her book that you can use your 8 minute sessions to increase your writing speed, so that even if you can only fit in 8 minutes, you will get many more words in. In my experience, timed writing increases my writing speed by eliminating distractions— I don’t look up facts on the internet or pull out one of my name books to name a new character. I skip that bit and do the research later. So I don’t end up spending 6 of my 8 minutes fooling around online. The accountability partners really help. I feel a little silly when I tag the participants and interested persons on Facebook every day. But they can tell me not to do that if they don’t want to any more. The posting— and the comments and ‘likes’ of the others— motivate me. And it’s great to see other people doing their own daily 8 minute stints. So— do you have a habit of writing (or blogging) daily? If yes, how did you build the habit? If no, are you doing anything to change it? Perhaps you could try the 8 minute writing method to see if it works for you. If you want to join me and my friends/followers in the daily 8-minute writing, you can drop by my author page, https://www.facebook.com/nissalovescats/ and post your daily 8 minute triumphs there. You can also ask to be on my list of tagged people. I also do it on my personal FB page, https://www.facebook.com/nissa.amas.katoj Though maybe you should mention on my author page if you are making a friend request? You see, I want to make writing poetry a daily part of my writing life. It’s the kind of writing I’ve had a bit of success at. Writing a poem is something I know I can finish, and I know I can submit my poems to literary magazines and sometimes get published. But writing poetry is a money losing proposition if you have to buy sample copies of poetry magazines, pay for postage submissions, and get paid in nothing but contributor copies. And I’ve always dreamed of being successful at writing fiction. So working on my fiction project — a novella about a man who has to fight zombies to protect the innocent and clueless— is a priority for me. It’s something I can sell and perhaps generate money to support my poetry-writing habit. And then there is blogging. I’d like to be able to blog daily Monday-Friday in order to build this blog up into something that’s useful to other people. And an essential part of blogging is writing comments on other people’s blogs. I’ve heard of a man who habitually writes hundreds of blog comments a day and now has a blog with about 80 comments on each of his posts. So there I have three things that demand a place in my ‘first thing in the morning’ new writing habit. It’s enough to eat up my whole morning! And then there are other writing-related things I must do. Such as: social media activity, assembling-editing writing projects once written, and keeping myself alive and fed. So, this is a dilemma. I wonder what other writers do who need to do more than one form of writing daily. How do you pick which goes first? How do you arrange your schedule so that all of that gets done? Today I’m doing 8-minute timed writing sessions to get this blog post completed as the first writing act of the day. In part that’s because I’ve been sick and slept in this morning, and I do want to get my blog posts up around 7 or 8 in the morning. Perhaps when I get up earlier I can get some other writing done first and then shift to my blogging. 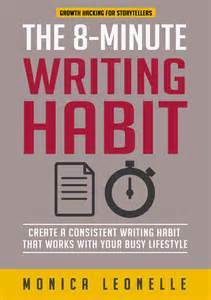 But maybe what I really need to do is FIRST establish a daily blogging habit using the advice in Monica Leonelle’s book, and THEN, after about a month of daily blogging, work on establishing the poetry and prose writing habits. What do you think? OK, you sit down this morning to begin a new writing project. It’s a good project. Maybe your best idea yet. But there is something that can slow you down with this project— maybe even bring it to a halt. This enemy is concern about writing outcomes. Do you see what you’ve done? You’ve changed what that current writing project is about. Instead of ‘I must tell a good story,’ you are telling yourself that your finances utterly depend on you finishing this story quickly and it being high quality and on it selling well right out of the box. So every word you put down must be perfect or you are financially ruined and can’t pay your bills and, who knows, will end up homeless and jobless and your life will be destroyed…. Can any story-in-progress stand up to that kind of weight? A number of years ago I was financially desperate. If I didn’t become a selling writer soon, I didn’t know how I’d get by, how I’d keep my home, how I’d stay off welfare. It was my absolute last chance, I told myself. What happened to the novel I was writing at that time? Was it the great success that changed everything? Well, no. I didn’t even finish it. Or the project after that one, or the next one. I had made each of those writing projects into my last chance for being a real writer, and for being a financially stable person. And as I wrote each project I came to a point where I knew that the project wasn’t good enough to do the things I expected it to do. That made it easy to quit in favor of a project that I felt could actually save me. I’ve been reading Monica Leonelle’s ‘8 Minute Writing Habit’ and one of the points she makes is to decouple your desired outcome from your writing from your writing project. Just write. Don’t worry about your dreams of what your writing career can accomplish. Often, there are better ways to get that outcome anyway. A better job— or a part-time job on the side— might fix your financial woes quicker. Taking a college course related to your day job may get you the extra status that you think being a writer will get you. There is a principle that you might follow. “Sufficient unto the day is the evil thereof.”** In other words, concern yourself with what you need to do today in your writing. If you are on day 1 of outlining or Snowflaking the story, don’t look for your book cover artist or worry about your book marketing plan. Those are things to do on future days. Think about the things you must do today, and ignore the rest until it becomes the next thing you must do. ** Matthew 6:34 Take therefore no thought for the morrow: for the morrow shall take thought for the things of itself. Sufficient unto the day is the evil thereof.